Like November is here! I have only been waiting for this day since like, the beginning of August! I am such a freak, I mean who starts thinking about the holidays in the heat of the summer? Basically what I’m trying to say is that this post has been a long time coming. While everybody was enjoying all the things that go along with October, I was roasting turkeys, mashing potatoes and eating Thanksgiving dinner. Or well, at least towards the end of October I was. I try to be on top of things, but then somehow I always fail. But hey! I got the turkey made and um, I am pretty dang happy with it. I mean, come on. Doesn’t it look perfect?!?! Ok, so here’s the deal. When it comes to the holidays, I am all about traditional. I love traditions and to be honest, I don’t like breaking them. That said, I do love to switch little things up just a little with things like side dishes and desserts. But the turkey? The turkey has to be classic. Herbs and butter. Nothing fancy, nothing overdone. Just classic, simple and delicious flavors. For as long as I can remember, my mom has always cooked the Thanksgiving bird. Even last year, she cooked the turkey. She is a good turkey roaster and we had a good thing going. I’d do the sides + desserts + apps and she handled the turkey…although last year, I do recall that she and my dad were out hiking for most the time the turkey was cooking leaving me to tend to it. Actually, as I recall, she and dad were still hiking when people began arriving for dinner. Typical. Anyway, I love my mom’s classic turkey, so I took inspiration from her, read a whole bunch online and then made some turkeys (yup plural, and I still have three more to make between now and Christmas). And you guys, I swear by this turkey you see here today. It’s perfection and I could not be more excited about it. As you can read from the title, Herb and Butter Roasted Turkey with White Wine Pan Gravy, my turkey is simple and traditional. Pretty sure it doesn’t get much more classic than this. The secret to my turkey is a butter soaked cheesecloth. I read about this method of cooking the bird in this month’s Food and Wine. The second I read about it, I knew I had to try it. It’s flipping genius! You soak a layer of cheesecloth in melted butter (mine is full of fresh thyme, sage, parsley and lemon zest!) and then drape the butter soaked cheesecloth over the bird. Then you roast the turkey with the cheesecloth ON the bird. The cloth protects the skin from burning all while basting the turkey with butter the entire time it roasts. Genius I tell you, and the skin comes out perfect, the meat is incredibly moist and the flavor is spot on! You do not even need to tent the bird with foil, the butter soaked cheesecloth works magic guys and it could not be easier. Soo the gravy though?!? My mom has alway has always had trouble with gravy. Like it was either clumpy, too thin or flavorless. I get it, gravy can be hard, but this pan gravy will make your life simple. Nothing too tricky and it gets made in the very same pan you roast the turkey in. Hello less dishes – YES! So are you excited yet?? Are you going to start planning Thanksgiving? It’s T-minus twenty days away and I have then next couple weeks packed with my personal Thanksgiving menu. Think sweet taters, pies, cookies, mashers, casseroles, salad, bread and the works. I may even throw a few drinks your way this holiday season too. Wait, question: are we into drinks? Like cocktails? With booze? Let me know. It’s gonna be a really good November. But since Turkey is the star of the show, I figured I would start there. Next up are the apps, sides, desserts and a couple easy dinners too (you know cause we all gotta eat between now and the big day – duh!). YUM. Did you break out the stretchy pants yet, cause I think it may be time. I am full-force (like intensely so) in all holiday GO mode, so excited! SIDE NOTE: My dad asked, since we had turkey in October, if that meant we could skip it at Thanksgiving. I practically looked at him like he was insane. I mean, what??!? Who skips the turkey on Thanksgiving? Guys, he is out of his mind I tell ya. Like losing it BIG TIME. Or he’s just a giant Scrooge, thinking a combo of both actually. It's finally time for Turkey Talk!! I LOVE this herb and butter roasted turkey with white wine pan gravy. Remove the turkey from the fridge one hour before roasting. Remove the giblets + neck and rinse the bird off, pat dry and allow to come to room temperature. To make the compound butter, finely chop the sage, thyme + parsley and add to a bowl with the butter. Add the lemon zest, salt and pepper, mix well to combine, making sure the butter is smooth and the herbs evenly mixed throughout. Preheat the oven to 450 degrees F. Position a rack in the lower third of the oven. Season the cavity of the turkey with salt and pepper and fill the cavity with the, lemons, garlic and onion. Gently lift the skin of the turkey by using your fingers and going in between the skin and body of the bird. Rub half of the compound butter under the skin of the bird, spreading some of the butter on top of the skin as well. Take the remaining butter and melt it over the low heat on the stove or in the microwave. Dampen your cheesecloth with warm water and squeeze dry. Submerge the cheesecloth in the melted butter, making sure all the cheese cloth has soaked up the butter. Lay the cheesecloth over the bird, covering most of the bird. Drizzle any remaining butter over the turkey. Pour about 4 cups of chicken broth into the bottom of the roasting plan. Place the roasting pan in the oven and roast for 45 minutes at 450 degrees F. After 45 minutes reduce the oven temperature to 350 degrees F. and continue cooking for another 2 hours (until the turkey registers 160 F. on a meat thermometer), adding 1-2 cup of broth half way through roasting. I like to baste the turkey with the drippings 2-3 times throughout cooking and when doing so rotate the roasting pan. 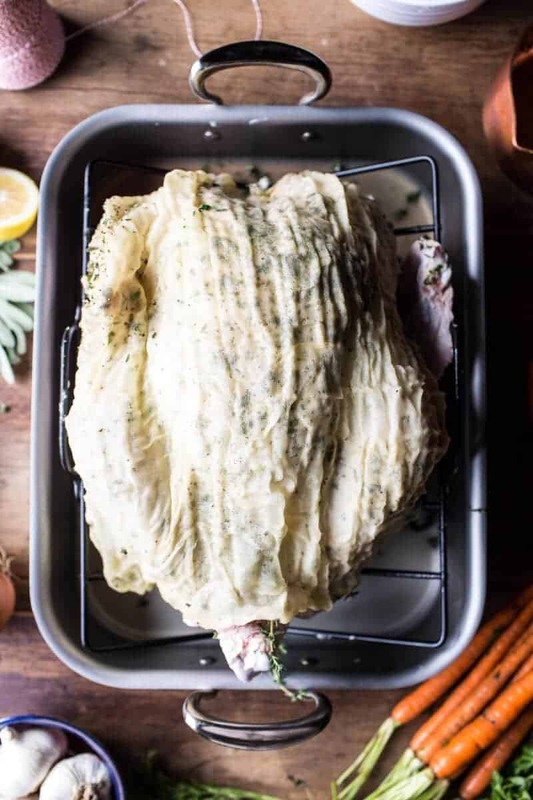 Remove the turkey from the oven and remove the cheesecloth, transfer the turkey to a baking sheet, tent loosely with foil and let rest 20-30 minutes before slicing. To make the gravy, strain the liquid from the roasting pan, skimming off most of the fat. I like to pour the broth into a 4 cup measuring cup and then place in the freezer for 10 minutes. This helps the fat rise to the top of the surface. Once you have skimmed the fat, add enough broth to equal about 4-5 cups total of drippings/broth. Place the roasting pan over two burners and add a splash of wine (about 1/2 cup) to deglaze the pan. You want to scrape up all those brown bits on the bottom of the pan. Once the pan is throughly deglazed, add the butter and once melted, add the flour whisking to combine. Cook stirring constantly, until the mixture is golden, around 5 minutes. Increase heat to medium high and add the remaining 1/2 cup of white wine, whisking as you go to let the wine reduce down. Slowly add reserved broth, stirring constantly, until the mixture is smooth. Stir in the sage and cook, continuing to stir, until the gravy has thickened to your desired thickness, around 8 to 10 minutes. Season to taste with salt and pepper. Serve warm with the turkey. *Cheesecloth method adapted from Food and Wine November 2015 Issue. *To save a little time, you can prepare the compound butter up to a week in advance. Just store, covered in the fridge until ready to use. That picture? It makes you happy and excited, right?? I know, me too!! Oh boy!!! It looks really good!! I never roast whole turkeys – there’s just three of us!! – but I roast whole chickens, so I guess this could work out fine with a chuck, right??? YUmm, I am salivating, though!! Yay, for November finally getting here! I’m so excited with you and your turkey looks like it just stepped out of a movie. It’s perfect! I will definitely have to try that cheesecloth trick and I can’t wait to see all your upcoming Thanksgiving stuff! Thanks Tori! Hope you had a great Monday! Gee, I am game to try this ! Cheesecloth ….what a great idea 🙂 . I just hope my turkey looks as good as yours !!!! Thank you!! Hope you love the turkey! I honestly don’t think I need to tell you how scrumptious this looks, or that it’s not just man food, or woman food, this is soul food! Nothing beats a perfectly browned turkey. Wife and I cooked a turkey last year and the dang thing was pink so we ended up feeding it to the dogs. We were scared! PS try and cook it a bit longer this year, yikes! Oh My God looks amazing I will definitely try to cook this food & hope I will able to cook like you. Yay my favorite holiday is almost here! I’m big on tradition too and this looks amazing. I love the idea of the butter soaked cheesecloth. Dang, girl! That turkey is BEAUTIFUL! Thanks Lucia! Hope you had a great day! A butter soaked cheese cloth is a genius move! And what i’m guessing turns the turkey such a gorgeous golden brown color. This turkey is going on the holiday menu, for sure. Right! Thanks so much, Nicole! Hope you had a great Monday! This looks delicious – I’m a massive advocate of making gravy with white wine and pan juices. Oh my goodness yesssssss!!! Turkey season is the best food season. No I can’t! Time goes too fast! Thanks Christopher! Ok, I’m so coming to your house for Thanksgiving ;). 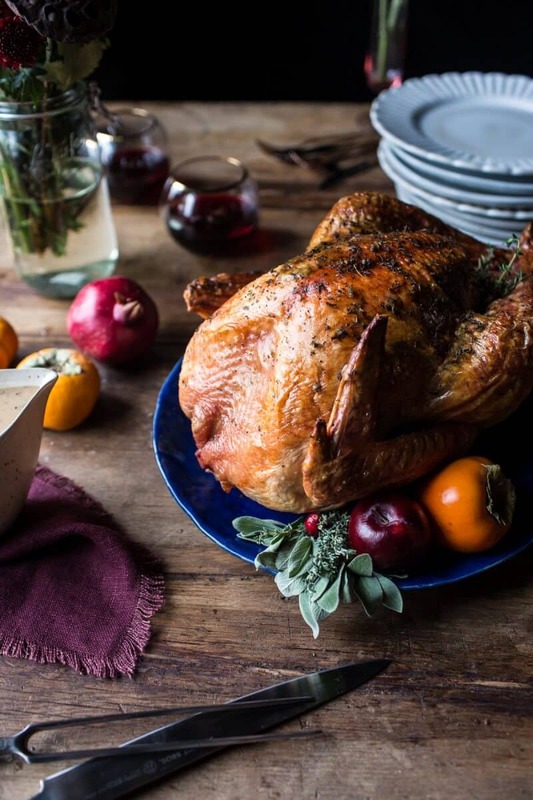 This is the perfect turkey and I love the sound of that white wine gravy!! Do you happen to have an extra seat at your Thanksgiving table Tieghan?? This turkey looks PERFECT! And that gravy sounds to die for! Awesome job! Awesome awesome… Looks really good!!! Gah I love how excited you get for the holidays. I feel like I found my thanksgiving/christmas time twin! Starting November 1st I am all holiday all the time. The music, the food, the drinks, the decorations, the movies! I get so excited hahaha. And then I read your blog and get even MORE excited. Just, YES! This turkey looks out of this world and that cheese cloth method is genius. My dad will probably never relinquish his turkey cooking duties but if he did, I would have to try that. Can’t wait to see what you have coming up next! Oh my oh my. That turkey is stunning!! STUNNING. Gah! There are only two of us in our household so far, but I plan on doing this with a chicken! Yum-o! Also, can I just give a bug and hearty “yes” to the boozy drinks? I always get super excited when I see a new drink post on your blog! 🙂 So creative! Okay, so for the past six years I have made my turkey following America’s Test Kitchen methods – I brine it for 12+ hours, let it dry out uncovered in the fridge for another 12 hours, then roast it, flipping it 3 times during cooking, slathering with butter each time I flip, in order to fully brown each side of the turkey. I then make a pan gravy with white wine and drippings. It turns out delicious and gorgeous and perfectly moist on the inside with crispy skin, but it’s a TON of work. Your way looks SO much easier! Quick question – it looks like from the pictures you roasted your bird breast side up, right? I did roast my turkey breast side up, always do! 🙂 Drinks are coming! My mouths watering, this looks really really good! Thank you so much, Jenny! Happy early Thanksgiving!! Can you please share what roaster pan you used? I am in the market and could use some guidance. Thanks. Hi! I use this: http://www.amazon.com/Mauviel-Stainless-5217-15-11-8-Inch-Rectangular/dp/B004ZH3DV2 Hope that helps! My mouth is watering! Would I need to change anything to do this with a chicken? Just the cooking times, a chicken will cook a lot faster. Thanks! I was so inspired by your cheesecloth idea that I just went out and bought one for Thanksgiving! Cannot wait to try your method! 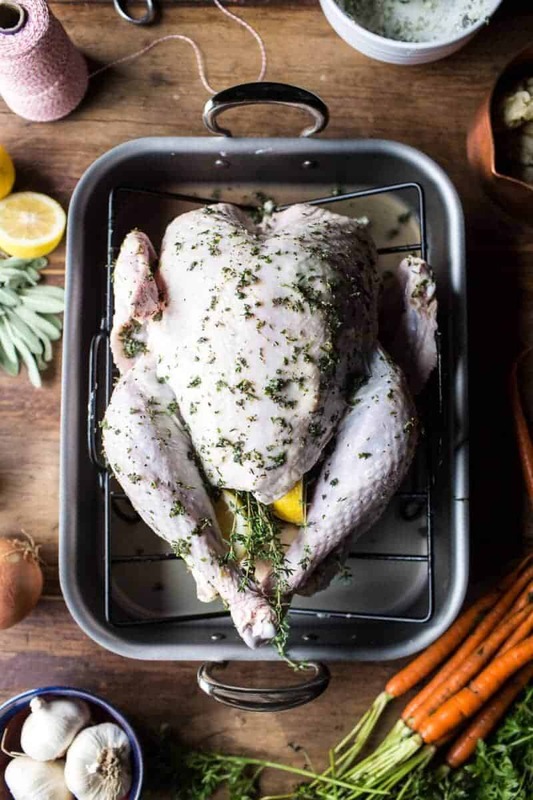 Quick question, do you brine the turkey on your own and if so which recipe do you use? YEAH!!! I do not brine the turkey, so I am afraid I can’t help there, BUT I thought this turkey turned out amazing with the brine. Thanks! Did you brine the turkey? I did not. Let me know if you have other questions. Thanks! Did the turkey come brined or did you skip it all together. I do not brine this turkey. I don’t think it needs it. Thanks! Do you recommend marinating the turkey in the cheese cloth in advance? Or given the technique it would be unnecessary? HI!! If you want to prep this in advance that will work great, otherwise you can just do it before baking. Hope that helps and let me know if you have any issues an or questions. Thanks! I would like to prep this the night before…how far would you go? Could I season and fill the cavity, rub the compound butter and place the cheese cloth on top the evening before so I only have to pop it in the oven tomorrow? 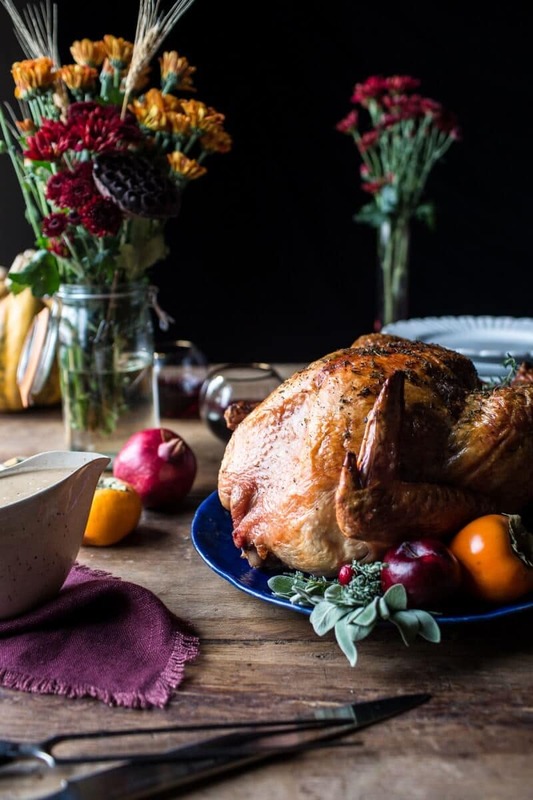 I have a 20lb turkey…how much cooking time should I add on? Recipe and technique look great! Excited to try. Thank you! Hey, I love your blog! Very thank you for sharing awesome posts! I like the idea of the cheesecloth just wonder how you were able to get the top of the turkey golden brown being it was covered with the cloth. Can you tell us if you took the cloth off for a period of time to brown? Did the cloth begin to burn once the butter was absorbed by the turkey? HI!! I leave the cloth on the entire time and it does brown a bit, but it also leaves the turkey’s skin beautifully golden. Just follow the directions as written and you will get the golden skin! 🙂 Let me know if you have other questions. Hi. I’m going to attempt this! (Fingers crossed). What do you do with the neck and giblets? Can you throw it in the pan while cooking turkey? Hey Kristi! I have never done that so I really cannot say. I normally just discard the giblets and then sometimes simmer the neck with the gravy for more flavor, but more often than not I just discard both and cook the turkey without each. Let me now if you have any other questions. Hope you love the turkey! What times would you need if you had a much larger turkey, say 24 pounds? Hi! I looked up online and around 4 1/2 hours. Hope you love the turkey and happy Thanksgiving! Do you recommend brining the turkey or is that unnecessary? Oops. Just saw the other post. Sorry! Thanks! CooL! Hope you love the turkey! Happy Thanksgiving! Hi!! So Im cooking Thanksgiving for the 2nd time in my life. And we have additional family joining us, one of which is my mother- the super critic. I have gone and gotten all the ingredients you listed, and will be following your recipe. Curious questions about the stuffing of the bird.. 1. Did you stuff anything into the neck cavity? 2. Did you cook your stuffing alongside your bird? 3. Have you ever done the bird with stuffing inside? My mother has always done the bird, and she stuffs it with stuffing, so Im certain she will be asking me all these questions. LoL Sorry for the novel. Hope you have a wonderful Thanksgiving!! Thanks again for this amazing recipe! How long would you recommend for a 20 lb turkey? I, a novice turkey cook, made this to your exact specifications, and though I was afraid it would get too dark, it was absolutely perfect! Even family members who don’t usually like baked turkey enjoyed this moist and flavorful bird! And the gravy also knocked the socks off the canned stuff we had in reserve. Many thanks to you for this recipe I plan to make for years to come! I am super picky about my poultry, as in it must be perfectly tender with crispy, tasty skin. I’ve tried so many different methods – al foil, bacon wrapped, cornbread stuffed – and now I have found the holy grail of turkey recipes. Thanks for making me look like a super star on Turkey Day! A post Thanksgiving thank you! Reviewed many recipes but chose yours to prepare my turkey this year. My end result, a moist and delicious bird! I received rave reviews from my family and the gravy…to die for! The preparation was simple, and loved all the fresh herbs that went into the butter. Thank you again, and love all the pictures you post along with your recipes!! Thank you for the recipe! Our turkey came out delicious!!! Everyone loved it. I made this recipe for our Thanksgiving meal this year. It was excellent and easy. The meat was juicy and perfect. Thank you for this wonderful recipe. I’ll be using it again next year. Thank you for the recipe! Everyone loved it. I hope so!! Thanks Carol! Delicious,I will try here, I hope it stays like yours, was very beautiful, and tasty course! Perfect! I am happy you liked it!! Thanks so much! Hi what kind of white wine did you use for the gravy? What kind of wine do you get for this recipe? I do not drink and have no knowledge of wines. Also, I’m a novice at cooking and this may be a silly question but is it okay to serve this gravy to children due to the wine? I’m cooking the turkey for thanksgiving for the very first time and I’m so nervous. But your pictures look gorgeous and I hope my turkey turns out as beautiful as yours. So, I only cover the turkey with the cheese cloth while it cooks ? or with a lid as well ? and the cheese cloth wont stick to the skin ? This was AHmazing ! thank you so much. This will be made every turkey dinner from now on ! Thank you! I hope you love the turkey and please let me know if you have any questions! I hope it goes well for you Victoria! Thanks! Hi Tieghan! I’ve been following your blog for well over a year now and I love it and it has never failed me. Can I adapt this recipe for JUST a bone-in turkey breast? I would love to cook this up for my family this Thanksgiving. It’s my first time cooking! Eek. Thank you! Thanks so much. 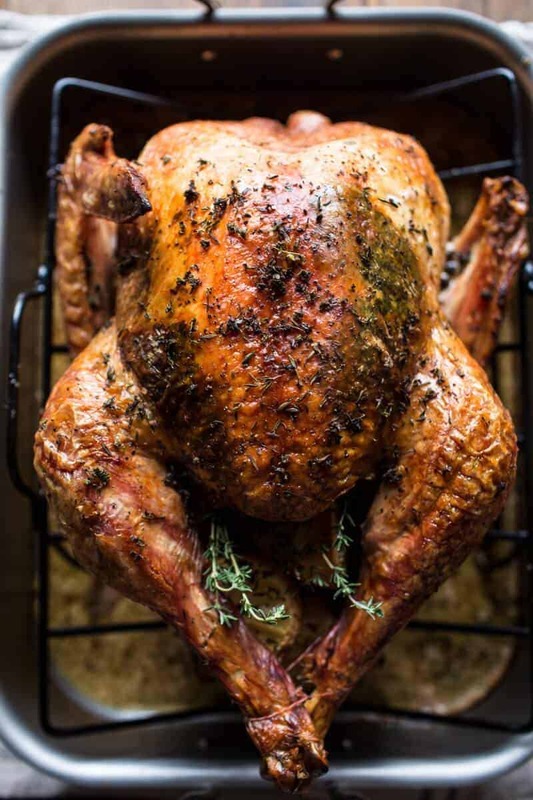 Would you recommend browning the turkey breast (about 7-8 pounds) at 450 and then lowering the temperature to 350 after 40 minutes or would you only roast the turkey at 350? Thanks again! I think you’re awesome! Hi! This looks great – can you recommend a cheesecloth brand to use? Thank you, Kathleen! I like to buy this cheesecloth: https://www.amazon.com/Pure-Acres-Unbleached-Cheese-Cloth/dp/B00JS70WEU/ref=sr_1_4?ie=UTF8&qid=1479274024&sr=8-4&keywords=cheesecloth Let me know if you have other questions. Thanks again! I love your blog. Just curious: with the butter soaked cheesecloth method, I know the skin browns but is it able to get crispy? I love this recipe! I am going to brine my bird instead of using a cheesecloth. Planning to use this same herb/butter rub. Do you think that I can use the same roasting method? I like a crisp skin. Thinking the brine will replace the moisture that would be preserved using the cheesecloth. What do you think? Hey Jennifer! To be honest, I have never brined a turkey, so I really cannot say what the result will be. I would think the cooking time and temp would be similar, but again I do not know for certain. Hope you love the turkey and Happy Thanksgiving! Hi! I don’t know if you would know the answer to this question. It’s similar to the one just above me. Would the turkey end up being weird if I brined it AND covered it in the cheesecloth? 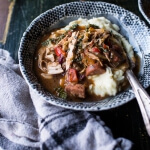 I found a brine recipe that I would love to try, but I also love this turkey recipe! Hey Lindsay! I have never brined a turkey, so I am unsure. That said, I am sure you can brine it and use a cheesecloth. I don’t see why that would not work out great. Let me know if you have questions. Happy Thanksgivng! So this will be my second time using this recipe for my Thanksgiving bird! It was a hit last year – and it was my FIRST time ever doing a turkey!! I am so glad you are loving this recipe and it made its way into your family traditions! Thank you Cindy! Thank you Jessie!! I’m so happy you liked them!! WOW! So nice!! SO happy it was a hit! Thank you so much for this fantastic recipe! This is the second year I’ve made this (we do Thanksgiving early) and both times it turned out so beautiful and delicious. I’m wondering if you can add in the instructions to stuff some sage and thyme into the bird cavity (you mention it in the ingredient list and pictures but not below). Happy Holidays!! I agree with you Liz T. I am making this dish and I don’t know how many (herbs) I should stuff in the turkey…? Can you advise? Thank you so much! I am very excited to try this recipe!! Hi Jenny! I use use and handful of each each so, 2-3 thyme springs and sage leaves. Let me know if you have questions. Hope you the turkey and happy Thanksgiving! I bought a Butterball Turkey. Can I still use your amazing recipe or will it be too much butter using the buttered cheesecloth? HI Barbara!! I think using a butterball turkey will be fine. I have not done it, but I don’t dee what the issue would be. Let me know if you have questions. Hope you love this and happy Thanksgiving! ? I just made this turkey this past weekend for my pre-Thanksgiving celebration with my roommates and friends. This is only my second time roasting a whole turkey on my own, and this is the most moist and flavorful turkey I’ve ever had (rave reviews from the friends and roomies as well)! The cheesecloth is GENIUS. Thank you for such a wonderful recipe and for such easy to follow instructions! I’ve already bookmarked this to make it again next year. WOW!! So happy it went so well!! I couldn’t be happier to hear this!! Thank you so so much!! 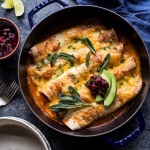 Hi Tieghan, I’m planning on using this recipe for Thanksgiving this year (it looks amazing!). I’m going to do everything according to the recipe, but I have a big family and my parents want to do 2 (14-16) pound turkeys. Would you recommend changing anything to accommodate 2 turkeys? Thanks so much!! Hey Meghan! No need to change anything, just make sure the turkeys are cooked through before cutting. Are you cooking them in 2 ovens? if so the recipe should be fine as is. Let me know if you have questions. Hope you love these! Thanks! I am cooking this tomorrow for the in laws. Just wondering, is the meat thermometer stuck in the thigh or the breast? I saw both methods and this doesn’t specify. I also wonder as traditional recipes call for 180 in the thigh, and lately I’m coming across sites that claim 155 – 165 in the thigh is plenty and anymore would dry the bird. How do you do it? Hey Paula! I stick mine in the breast and I cook it to at least 165 degrees F. but please do what feels best to you! Let me know if you have questions. Hope you love this! Thanks! It looks like you trussed the turkey? I’ve read it can lead to white meat being dried out… recommendations? Also, what are the specs of the seasonings going inside of the turkey? I.e how many lemons? Or just the one lemon the zest was taken from? Also, how are you rotating the pan? Horizontal to vertical? It’s my first year and expectations are high from everyone ? Hey Nadia!! I have never heard this, but I don’t have any issues with my turkey being dry. I use 1 lemon (the one I zested and a handful of fresh herbs inside my turkey. I roast my turkey horizontally. Let me know if you have any other questions. I am happy to help in any way. Hope the turkey is a huge hit. Happy Thanksgiving! In the ingredient list you have 2 lemons, halved but in your response to Nadia you state that you use only the 1 lemon which you zested. Should I use 1 or 2? Hey Angie! I am so sorry for the confusion. Either 1 or 2 lemons will be fine, but I used 2 for the turkey pictured since it was on the larger side. If you can fit two lemons halves in your turkey go for it, if not just use 1. Let me know if you have any other questions. Hope you love the turkey and Happy Thanksgiving! I’m planning on doing this tomorrow, how long do you suggest cooking it if it’s a 20 lb turkey? HI! I recommend 41/2 to 5 hours, but be sure the turkey is fully cooked before slicing. Let me know if you have questions. Happy Thanksgiving! Hi! I put the turkey on a rack. Let me know if you have other questions. Happy Thanksgiving! Thanks. Its in the oven as we speak. Cant wait. This looks marvelous. I have a couple of questions. What is the reason for the cheesecloth? Also, Will the cheese cloth stick to the turkey and pull the browned skin off, or does it come off without sticking to the turkey? Thank you so much. Happy Thanksgiving ? Here’s a question I haven’t seen here! I realize it’s Thanksgiving and you won’t be getting back to me today but can I take that yummy roasted garlic inside the cavity and add it to my mashed potatoes ie food safety? First time trying this! Have a great Thanksgiving! My mom and I made our turkey for thanksgiving this year using this recipe and it was absolutely delicious. It came out juicy and golden brown and filled with flavor. It was a huge hit and not at all difficult to prepare. The gravy was fantastic, as well, and people said it was their favorite part of the meal. Thank you for sharing this! YAY!! SO happy it all came out well!! Thanks so so much for making it Ashlie!! This recipe is amazing! Everyone loved it and it was very easy to make thanks to your detailed directions. The cheesecloth really keeps the turkey moist and the flavors are so rich. I made the gravy in a saucepan and forgot the sage but it didn’t matter – it was delicious (even my former gravy hating kids couldn’t get enough). Thanks for yet another excellent recipe. I’ve got it bookmarked for next year! I do not like turkey. I have never liked tofurkey. It is always dry as dust and never has any flavor. Until today! What follows is how I followed your recipe. The Monday before Thanksgiving I made the compound butter, wrapped it into two rolled packages and put it into the refrigerator. Tuesday evening I pulled out the turkey breast (as we didn’t have enough people to justify the entire bird) and put one of the rolls under the skin of the turkey, put the turkey on the rack of the roasting pan and put it into the refrigerator uncovered to allow the skin to dry out for a little over a day and a half for crispier skin. Obviously a small turkey breast did not take as long to cook as your big bird, but the cheesecloth came off easily (I was concerned about that) once it was finished. The flavor! Oh my goodness, it was amazing! I will never cook turkey any other way! Thank you so much for sharing this wonderful recipe. WOW!! YAY! I’m so so happy it worked out for you! Sounds like you made an amazing thanksgiving dinner!! Thanks Holly!! I asked about the garlic clove earlier but never mind. This was the best turkey ever. Don’t know how the cheesecloth method works but it made the best turkey I’ve made in years. And the best gravy! Didn’t even need to drain any fat off. Thanks so much! YAY! SO happy to hear that Patti!! Hope you had an amazing Thanksgiving! glad I found this on Thanksgiving eve. I used this recipe for my first ever turkey this year, and it turned out great! Not dry at all!! Now instead of being scared to roast a turkey, I can’t wait to do it again! So happy you liked it Rachel!! Hope you had an amazing Thanksgiving!! I have water in my mouth, it must be wonderful! I just made this recipe por a xmas dinner I had with friends and was a total success! I’m making it again for xmas dinner with my family and just have one question. My mom’s oven doesn’t have a roasting option, is it the same time if I use a conventional oven? Hey Lilian! So happy you love this recipe! for a convection oven, reduce the oven temp by 25 degrees. The turkey might cook a little faster (that is what a convection oven does), just be sure to check it throughout cooking with a thermometer. Let me know if you have questions. Happy Holidays! ? Thank you so much!! Just made it and the timing was perfect with your directions! Best wishes this Christmas! So happy it was good! Thanks Lilian! WOW! Great question, Lilian! I have a convection oven also, and I am soooo glad you asked this! I take it that we lower the temp. from the 450 degrees for 45 min., to 325 for the rest of the time? Is that correct? Hi Leslie, I would roast at 425 for 45 minutes and then 325 for the remaining time. Let me know if you have other questions. Thank you soooo much for responding, & explaining that I need to reduce the temp. of my convection oven. I would not even have thought of that! I’m excited to try this,and by the looks of all the responses, it looks like it will be a hit!!! Keeping my fingers crossed! Have a Merry Merry Christmas!! Your welcome!! Hope everyone likes it!! Merry Christmas! Hi! This is my first time ever cooking Christmas Dinner and I’m a little intimidated. I’m planning on making this recipe and a prime rib. Question: If I cook the turkey the night before and cover it in romaine then slowly heat it up so that I have the oven free for the prime rib, will that work? Sorry! I’m a dinner party cooking novice so I’m just unsure of how to go about this all. Thank you! Hi half baked harvest! Please ignore this question, I will be making my turkey the day of and following the recipe to a t. Thank you:)!! Thanks Danielle! Let me know if you have other questions. Hope you love this and Merry Christmas! HALFBAKEDHARVEST, PLEASE ANSWER THE LAST 2 COMMENTS!!! I know this is a busy time of year, but we need answers! Hi Leslie, I am sorry. I respond to comments every night. Sometimes and upwards of 100+. Occasionally some can be missed. I hope you understand. I have answered your comments. Let me know if you have other questions. Merry Christmas! Well, I have to say that this was the Juiciest, most flavorful turkey we have ever had! A lot of my guests commented on how wonderful it was! I did have some issues, however, while preparing it, and could use some suggestions for next year. For one, I had heard that we should NOT baste the turkey while cooking due to the fact that every time you open the oven door, the oven looses heat, & the turkey takes longer to cook….mine took a little over 3 hours (14-15 pound) with a convection oven because I followed your direction to a T. After the first time I basted, rotated the turkey, I thought Oh No, it’s going to take forever to cook! Then the gravy….Mine was totally BROWN!!! Again, I followed your steps in the direction, but wasn’t it suppose to be a light color? One of my guest said it looks like a beef gravy, this is turkey!!! What went wrong? Hey Leslie, I only baste the turkey if there are ton of drippings that have fallen to the pan, it is definitely not needed if you prefer not to. As for the gravy. how did it taste? Mine is typically darker brown too, but my family loves this! Let me know if you have other questions. Hope you and your family had a Merry Christmas! I am glad to hear that your gravy was dark brown too, not like the photo! I did have a lot of brown bits on the bottom of the pan, so hence, maybe that is why the gravy was so dark. 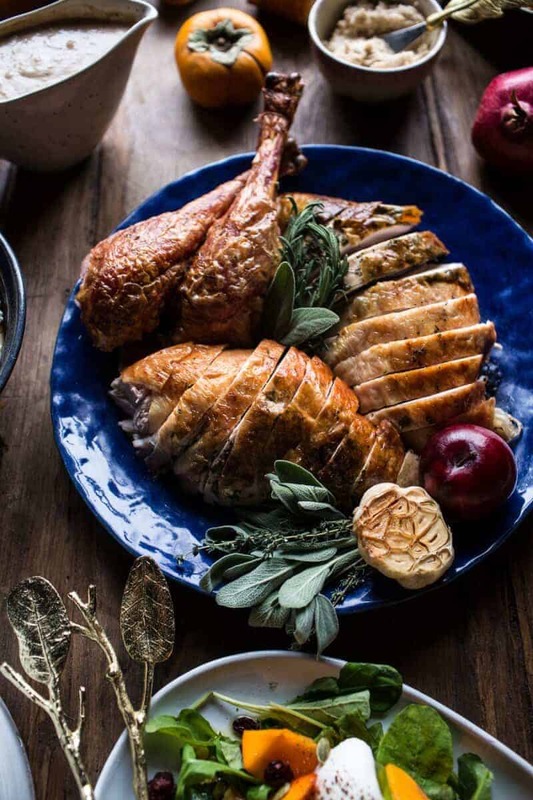 Any tips to have the gravy color like the photo? The gravy is very good, so I can now rest easy!!! Thank you again for a fabulous recipe!! When I say the gravy was brown, I mean it was like “Chocolate Brown”!! HI Leslie, where there a lot of browned bits in your pan? Again, how did it taste> If it tasted delicious, I really would not worry about the color. I’m happy when I find articles talking about Delicious, Thaks! What a sensational recipe, I really enjoyed it, I’ll make one now! Thank you i hope you love it! Realmente verifiquei novamente as dicas e não posso deixar de dizer que é perfeito, vou fazer. Obrigada por compartilhar. Wow, it’s very beautiful, I’m going to try and do it. It must be a delight. Thanks so much Paty! So happy you chose it, hope it was delicious! Warning: Never see this with hungry! Haha! Might not be the best idea! I love Turkey and I loved this recipe. Thank you so much to share it with us, I will try it . Hey Dean! Yes, I baste right through the cheesecloth. It works great!! Hi!!! I had a quick question. I wanted to try this recipe this year. But we need to use an electric turkey roaster. Do you forsee any problems with that method or any adjustments that may be necessary? Thank you so much!! This sounds awesome and you make it seem so simple! I’m going to be roasting my first turkey this year for a Friendsgiving we are hosting. We’re planning on getting a 22-24blbs bird. Aside from doubling the butter/herb mixture to compensate for the larger bird, how do you recommend I adjust the cooking time? Thanks! Can’t wait to make this Turkey for Thanksgiving! It’s my first time roasting one on my own. We are planning on eating at 4pm and I am getting a 16-18lb bird. I know it says to roast at 450 for 45 minutes, then 350 for 2 hours. If it ends up being an 18lb bird, how much longer do you think I should roast it for at 350? Also, what time do you think I should put it in the oven to give it enough time to rest before serving? (I initially was thinking around noon) Thanks so much for all of your recipes. Your blog is my go to for everything!! 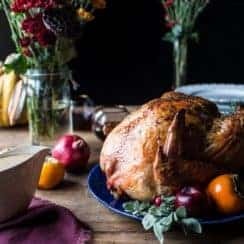 If my turkey is 23lbs how would I adjust the cooking times and degrees? To truss or not to truss? That is the question. I’m trying your recipe for the first time this weekend for a Friendsgiving. If I was to make this recipe with a chicken, how long would it cook for and at what temperature? Thanks! Hey Tieghan, can’t wait to try this cheesecloth method this year for my first solo thanksgiving meal!! One quick question, do you have any recommendations on what kind of white wine to use? Not a brand, but do you use a pinot grigio, chardonnay, etc? My husbands family does just turkey breast, and I have the honors this year is hosting thanksgiving at my house. I really want to try this, think I could adapt it to a breast? Do you brine the turkey before roasting? Hello! I am excited to try your recipe, but I am wondering about a substitution. My MIL is allergic to citrus. Do you have a recommendation if I cannot use lemon? Can’t wait to try this next week. My first time ever making a turkey and this sounds delicious! What kind of white wine did you use? Thanks! My turkey is 22.44 lbs….how long do I roast it? Does the cheesecloth stick to the turkey? Does the turkey skin get crispy? That seems like a very high temp for a bird. We usually bake it at 300 for about 4 hours. It is still juicy? Thanks!! Can’t wait to try this!! I have a 27 pound turkey ( I raised it) what is your recommended time for it. I usually would do 350 at 15 mins per pound( unstuffed). I am not sure if starting at 450 temp then dropping to 350 applies to that 15 min rule.. I couldnt find a cheesecloth in my store. Any suggestions for a substitute? Great! Thank you Ali! I hope you had a great Thanksgiving! Thank you Sarah! I am so happy this turned out amazing! I have been hosting Thanksgiving dinner for my family + any stragglers for the last 20 years since my Dad passed away. I experiment with sides but the turkey has always been the same. This year I tried this recipe with the compound butter and the cheesecloth….WOW!!! It was the PERFECT bird agreed everyone. Thank you for another crowd pleaser at my house. I came across your blog and after cooking the pappardelle with sausage, butternut squash , san marzano tomatoes & burrata I was hooked! I took your cookbook out of the library (made 4 or 5 fabulous dishes) and then bought it! My kids now ask if dinner is from “that girl’s cookbook?” I look forward to your Christmas recipes. That is so sweet of you to host the Thanksgiving! I am really happy your turkey turned out amazing! And so glad you like the cookbook! I hope you had a great Thanksgiving Eileen! This was absolutely the best turkey I’ve ever had. It’s the first time there was more leftover ham than turkey. Yum!!! That is so great! Thank you Bethany! I am so glad this turned out amazing for you Linda! I cannot wait to see the photo next time you make this! Thank you! What would the cooking time be if I wanted to add dressing inside the cavity? Looks delicious! Omg! First time attempting to cook a turkey. I have to say thank you!! I’m so glad I found you just in time. It’s came out great. Everyone really enjoyed it. That is so great! Thank you Bertha! Made this turkey yesterday for Easter dinner. My first turkey ever! It was so good. The cheesecloth method and adding the broth makes the turkey so moist, but crispy at the same time. I am so glad this turned out amazing for you Ally! Thank you! Hello I’m making my first turkey this year and am a little intimidated. I was planning to brine, but this looks much easier! There are only four of us so I’m getting an 8lb bird. Would you still cook at 450 for 45 minutes and then finish at 350? Or would you reduce the amount of time at 450 since the total time will be much less than yours was? This looks amazing! Quick and potentially silly question. Cheesecloth …. I went to amazon to order and there are different grades….what do I buy!!! Thanks in advance! This looks great! We’re hosting a small group & had planned on doing turkey breast. Could this be adapted for turkey breast? How would you do that? I’ll be roasting a turkey this Thanksgiving and was glad to find this recipe. 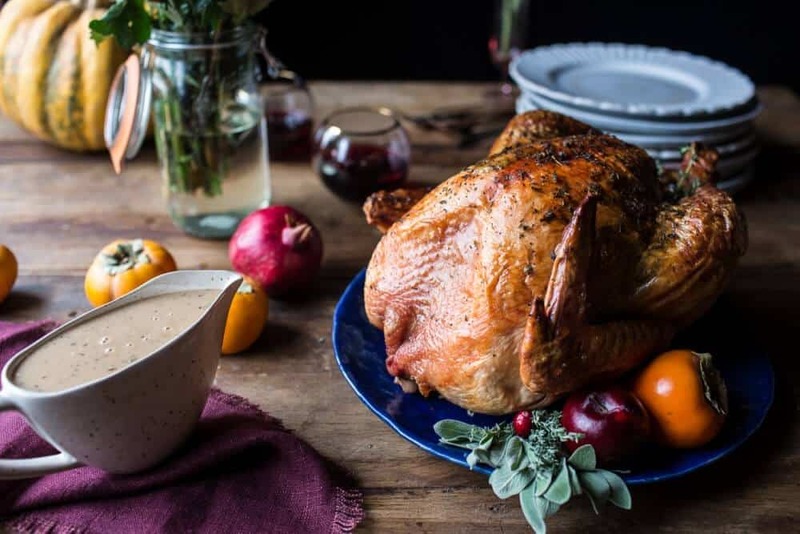 Food and Wine didn’t come up with anything new — my mother and grandmother used cheesecloth and butter to roast their turkeys to perfection too. Thanks for sharing your amazing recipes, techniques and creativity! I am so glad you are enjoying my posts and I hope this turns out amazing for you on Thanksgiving, Kathy! Thank you so much! I’m very much looking forward to using your recipe for this years’ Thanksgiving bird! This being the first bird I’m making on my own, I’m a bit nervous! I’m going to be using an electric roasting pan in order to free up our oven since we’re making the whole meal at our house. Do you think the instructions will be the same with use of the electric roasting pan? I imagine so, but not sure. Thank you!! Probably a silly question but do you remove the brown bits after deglazing the pan or do they stay in the gravy? Thanks heaps! Can’t wait to try. And is a roasting pan special and lift the turkey off the base of the pan, or does the turkey sit in the 4 cups of broth? I hope this turns out perfectly for you Brittanie! And I hope your boyfriend loves his first turkey on Thanksgiving! Thank you so much! This year will be my 3rd in a row making your turkey recipe. It’s the absolute best turkey I’ve ever had and it’s been a huge hit with my family. I’ve never we been impressed with the turkeys I had growing up. They were typically dry and flavorless. This recipe always turns out moist with to tons of delicious, herbal flavor. Thank you!!! Wow this is so sweet! I am so glad you love this recipe and keep making it year after year. Thank you so much Sarah! I made the turkey this way last year and my husband LOVED it. Definitely making it this way again! I am so happy to hear that! I hope this turns out perfectly for you! I follow you on IG and picked off so many of your recipes! I am definetly going to try making my bird this way this year! farmers market and ask them to spatchcock it for. I don’t think I would ever go back to making whole birds after discovering this method of cooking. I order two for how many I am feeding and we always have to have plenty leftovers for my son’s Mattwiches the next day! It seems to take some of the pressure off of cooking the day of because it takes about an hour and half till the Capon is done which frees up the oven when making the other sides! Love your IG! Happy Thanksgiving! I hope you your bird turns out amazing this way, Joann! Thank you so much! Omg, I made this for Friendsgiving yesterday. Absolutely delicious! Thank you!!! Thank you so much Kaylee! I am so glad you loved this! Will this be just as good if I purchase a frozen turkey? I am in the process of making this. Everything seems fairly easy to understand. My only issue so far is the butter spreading on top of the turkey before I put the soak cheesecloth. I patted the turkey dry but the butter was not wanting to spread. It was just falling off or clumped together. The turkey is in the oven. Wish me luck. Thank you for the recipe, I hope its a family tradition recipe. I should add that I am doing this as a practice turkey. My husband and I have yet to find the perfect recipe we both like. I liked the cranberry, citrus with cheesecloth method, he liked the moistness of the turkey but not the skin taste. Which is his fav part. Too fruity for him. Since then its been thanksgiving at my mothers and she just shoves a turkey in a bag and is done for a few hours. Finger crossed. Hi Michelle! I hope this turned out amazing for you. Please let me know! Does this still get brown with the cheesecloth on it or is there a point where I should remove it to make it the pretty brown you have? Also would this work with a bone in breast? I use Ina Garten’s breast recipe usually but maybe I could change it up! This looks great! 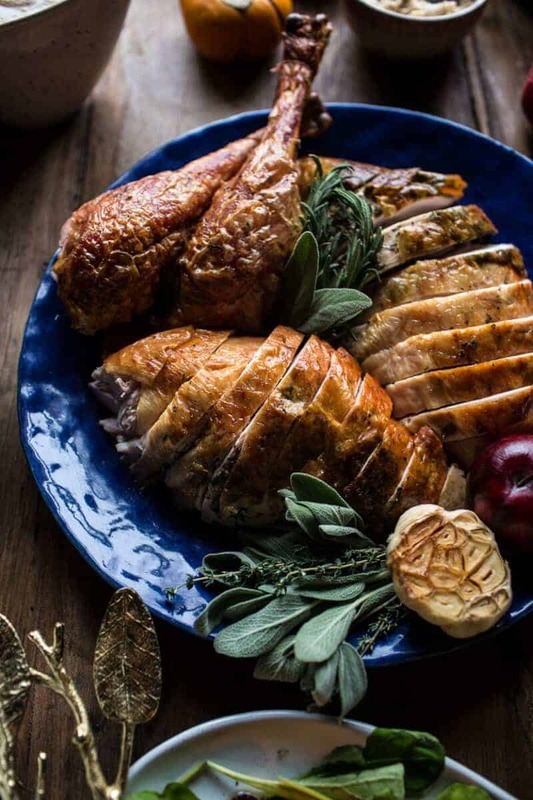 You mention stuffing the bird with garlic, onion, and lemons but do you think anything would be lost or not turn out as well if you stuffed the bird with traditional stuffing/dressing? Do you remove the cheesecloth to baste the turkey, or baste over top of the cloth? I’m having a hard time finding cheese cloth that says “double lined”. Where did you get yours or do you think double layering the cheese cloth with suffice? All the ones on amazon say ultra fine etc. Laura, I get mine at Bed, Bath & Beyond! It’s only $4.49! They are located where all the kitchen gadgets are! Ultra Fine 100% Natural Cotton. 9 Sq. FT. Works perfect every time! What kind of turkey do you use? Frozen? Fresh? Pre-brined? Looks delicious!! Did you bribe the turkey for a few days before doing all of this? Can’t wait to try it! I made this turkey last year for my first ever Thanksgiving, and am making it again this year as it’s my first time hosting! I’m incredibly excited because it was absolutely delicious and I’m hoping my in-laws will love it too. Do you have any tips on adjusting cooking time for a larger turkey? I plan on buying my turkey early next week, and am not sure if a 16lb turkey will suffice for 5 very hungry adults and leftovers for everyone to take home (and for myself to keep of course. Husband is hoping for a week long of turkey sandwiches). Looks delish! If my turkey is around 27lbs would I double the ingredients? Also would I cook it at 450 for the 45mins or would I have to do it longer? P.S I have made several of your recipes and they are always a crowd pleaser! I made this turkey last night for Friendsgiving and it turned out perfect! Thanks so much for the amazing recipe! I am so glad this turned out so well for you, Raven! Thank you! Hi! I am new at all this and was curious about the white wine. Is it just any white wine or do you recommend a certain brand? Looking forward to trying this! You say in the ingredients for the sage and thyme “plus more for stuffing the bird”, but then don’t say in the directions to include those with the lemon and garlic. Do I throw some in the cavity as well? Thanks! They don’t sell cheesecloth where we live (sigh…small town out of USA) Any suggestions as to another option? I do have an oven bag left over from last year? Thank you so much! 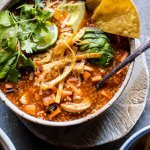 I used this recipe last year and turned out delicious! This year I have a bigger party and am using a 21 pound bird. What variations would I have to make? Has anyone tried this in an electric roaster?? Any tips? Can’t wait to try this on Thursday! Thank you!! Thank you! I hope this turns out so amazing for you! I can’t wait to make this. It will only be 2 of us for Thanksgiving dinner but as soon as I saw this recipe I knew I had to try it along with your buttery herbed mashed potatoes. YES! I hope you both love this recipe, Tracy! Thank you so much! This turkey looks gorgeous and I’m planning on making it for thanksgiving this year. One question though, does the cheesecloth prevent the turkey skin from getting crispy at all? Thanks!! This looks amazing!! (as are every recipe of yours that we make!) We typically use a cooking bag to reduce the cooking time of the turkey (cook it fully stuffed). Would you recommend not using a cooking bag if using the cheesecloth recipe? Thank you!! This is the second year I’ve made this turkey recipe and it is to die for. It does not get easier than this. The only thing I do differently is the compound butter… I found a mixture of herbs I like (garlic, rosemary, thyme) that I have stuck with. I’m really not a big turkey fan but for the first time in my life I can honestly say I enjoyed this turkey as well as the white wine gravy.. soo good!! Definitely a recipe I’ve shared with others and will continue to use! Hi Nicole! I am so glad you loved this recipe and hope you love it this year as well! Thank you! I never, ever leave comments, but I had to for this recipe! I followed the directions (we had an early Thanksgiving) and everything was spot on. Hands-down juiciest turkey EVER, and the gravy… amazingly delicious! Thank you so much for sharing. This is now my one-and-only-I’ll-never-need-another turkey and gravy recipe again. Thank you so much Alisha! I am so glad you loved this recipe! So is brining the turkey not necessary? Dear Tieghan, only what I can say is that you’re the best! I love every creation of yours. Just beautiful! I also admire your very talented brother, Red. What a talented family you are. Aw this is so sweet! Thank you so much! I hope you have a lovely Thanksgiving! Ohhh, so good! We made it a day ahead, supposed to save it for the family tomorrow. But dang, it’s so delicious, we kept taking tastes as we were carving it. Tee hee! As they say, sorry not sorry. It was a 24-pounder, we followed your helpful comments about 45 mins at 450 and the rest at 350, worked perfectly! The cheesecloth plus basting was like a magic formula for the most gorgeous skin. And those herbs make such a difference in the taste. My husband said it’s the best turkey we’ve ever made. I must agree. Tieghan H. Gerard (H is for half-baked) — You’ve done it again! Hi Julie! I am so glad this turned out perfectly for you! Thank you so much and I hope you had a wonderful Thanksgiving! It seems like a lot of salt for compound butter. After it’s mixed should it taste salty? Making this turkey today! Question: do we still put the cover of the roasting pan on? Or is just the cheesecloth On top and we don’t use the pan cover? This was the first Thanksgiving turkey I’ve made, and it turned out so well! Thanks for the great recipe! I am so glad you enjoyed this Kyle! Thank you! This is the worlds best turkey recipe EVER!! Thank you so much! Blew our minds! I made this turkey for thanksgiving and it turned out great. I’ll definitely make it again next year! This was delicious! Maybe the best turkey I have made so far! I will certainly use the cheese cloth trick again next time. Thank you! Thank you so much Kate! I am so glad you loved this recipe! Best Turkey ever! Should have taken a picture, it looked amazing! Absolutely delicious! Made this for Thanksgiving this year (my first solo turkey!) and it turned out perfectly. Made a 20-lb turkey, so just adjusted the recipe by ~1.4X and it was a serious crowd pleaser. Followed directions to the T with the exception of bird direction – I cooked the turkey breast-side down (just because that’s how my aunt always cooked the turkey!). Will make this again next year! I am so thrilled you all loved this recipe! Thank you so much for trying it out Susan! Thank you! Came out perfectly! Let me start by saying that I had never cooked a turkey before and I’m a pretty novice cook but this was SO easy and was insanely delicious. I have never had a better turkey in my life. Hi Arianne! I am so glad this turned out so amazing for you! I hope you had an amazing Thanksgiving! I tried this method just as instructed and my turkey caught fire- not kidding!!! Within about 20 minutes of placing in the oven the butter sailed chesese cloth was in flames. Followed entire recipe to a “T” and it wad hands down the best turkey and gravy I have ever served… family loved it. You have a local follower here, thank you! Wow I am so happy to hear that! Thank you so much LeeAnn! Incredible recipe! I used your recipe for my bird this year and it was so flavorful and moist! Lots of compliments to you! I made a white wine gravy with the drippings but used Ina Garten’s make ahead gravy recipe (also white wine based) – it was a great time saver without sacrificing big flavor! That combined with the flavors in the compound butter used on the turkey made for a stellar gravy. Thank you! I am so glad it turned out so amazing for you Sarah! Thank you so much! I made this turkey and gravy recipe and it was the best turkey I have ever made!! Thank you! Wow that is so amazing! Thank you Anne! I made my first turkey this past Thanksgiving using your recipe and it turned out wonderfully! Thank you! I am so glad this turned out so well for you, Dionisia! Thank you! Tieghan, GIRL!!! This is some of the best turkey I’ve EVER had! Thank you for sharing this recipe. Still this a great problem to have! Thanks again! Hi Ashley! I am so glad this turned out so amazing for you and your husbands family! That is so great! Thank you! This looks so good!! 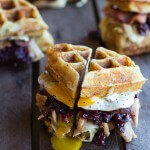 I want to make this for our New Year’s Eve dinner. How would the temperature/cooking time/ingredient portions differ if I were to use a chicken instead of a turkey? HI! It is very hard to say when I dont know the size of the chicken. Will is be the same size or smaller? For some reason I wasn’t able to reply to your comment above. It would be about a 5 lb chicken, so probably a little more than half of the turkey you used. It’s very hard to give you a cooking time without testing the recipe using a chicken. I would think you would cook around an hour and half. Hope this helps!